The Internet is an environment very different than any other media, and although at the beginning of its existence it had copied the details of the press, later on, it evolved and created its own style. With that evolution, it became a media focused on the user experience (what we call UX). Observe websites like Google and Facebook, and you will notice the enormous effort to fit the user experience more pleasant, functional, safe and straightforward as possible. The same happens with apps such as Booking.com or LinkedIn, which are extremely groomed to preserve user experience. But this evolution is not a merit of media and social networks, but an imposed solution by the consumers themselves, that have shown throughout the time that rejects sites and tools that don’t respect its browsing experience. 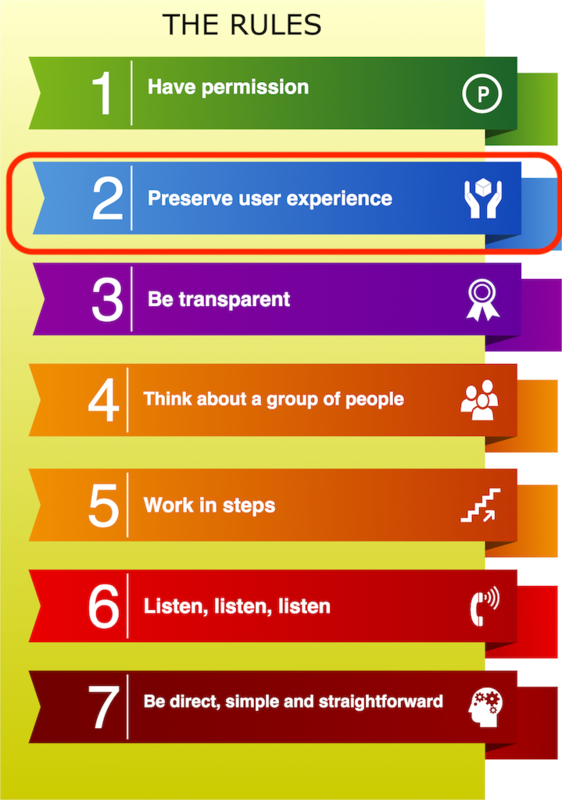 The consumer has three tools that ensure, whether you want it or not, the user experience. The first is the ‘back’ button on the browser. If they don’t like what they see, consumers will just leave. The second is the closing button with the browser. If the consumers really struggle with browsing problems, they will just close the window and open it again. Easy. Finally, the consumer usually has anti-virus and security tools at the device that detects lots of violation attempts against user experience, like virus, malware or tracking cookies. The consumer understands all of that as a risk and something negative. To create a website with pop-ups, blocking the ‘back’ button with the browser and forcing the user to inform their email to access content or using tracking tools that install themselves without authorization is the right recipe to ensure the user leaves the website and doesn’t come back. In other words, users will give up your site and never come back. Ever. Besides, websites that take too long to load with vast and unnecessary animations, and songs or videos that play automatically awake in the consumer the almost irresistible will to leave and ignore your website. Therefore, ensuring consumer experience is critical to avoid your website, blog, advertising social media interactions or message’s rejection. All priority must be given to this concept, preventing any kind of idea or strategy that negatively affects the user experience. Maintain the browsing experience of your consumer, and you will be maintaining your brand. There are millions of websites on the Internet, thousands of the same information your site offer, and hundreds of companies just like yours, with websites that offer the same thing. You either maintain the browsing experience of the consumer or they will quickly leave with a click, towards a site that respects them more.